"MFC has been actively working on the promotion of the Jatropha plant since activities began in 1999. A range of projects have been executed, focusing on different aspects of Jatropha production and use,from plantations, use as a living hedge, soap making, multi-functional platforms, jatropha as diesel substitute for transportation, etc. MFC's efforts received international recognition in 2003, when the German section of UNIFEM awarded a prize for the Siemenpuu Foundation funded project." "Jatropha can become an important resource for Mali. The local production means local employment, and local generation of income. 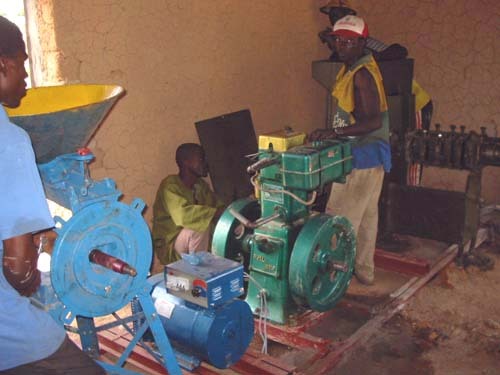 The potential benefit of jatropha technology to Mali, a country dependent on imported fossil fuels, is huge. And the significance of rural people producing their own fuel must not be overlooked."